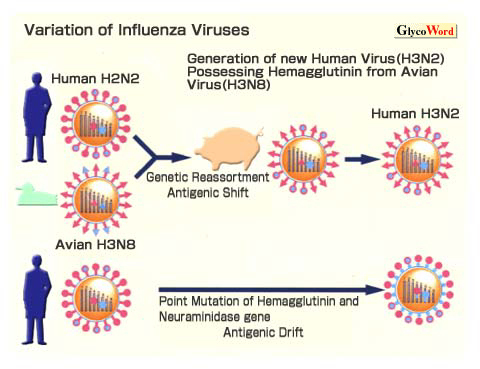 The Influenza A viruses have been isolated from a variety of animals, including humans, pigs, horses, sea mammals and birds. Each of the different antigenic subtypes of influenza A viruses (H1 to H15 and N1 to N9) has been isolated from wild aquatic birds. We found that all types of the hemagglutinin (HA) of human, pig, horse and aq. bird influenza A viruses, recognize sialyl lacto-series type I and II sugar chains (SA alpha 2-3(6)Gal beta1-3(4)GlcNAc beta1-) in glycoproteins and glycolipids in the target cells as common receptor molecules. However, we also found that avian and equine influenza viruses preferentially bind the terminal sialic acid alpha2-3Gal (SA2-3Gal) linkage, while human influenza viruses preferentially bind the SA2-6Gal linkage. Influenza viruses also differ in their recognition of terminal Neu5Ac, Neu5Gc and 9-O-Ac-Neu5Ac. We showed for the first time that SA distribution in animal species does in fact influence influenza virus host range. We determined that swine is the intermediate host between avian and human. Swine trachea has both receptors for avian inflenza viruses (SA2-3Gal specific) and for human influenza viruses (SA2-6Gal specific). In the case of horses, a virus with an HA recognizing Neu5Ac2-6Gal, but not Neu5Ac2-3Gal, failed to replicate in horses, while one with an HA recognizing the Neu5Gc2-3Gal moiety did replicate in horses. The abundance of the Neu5Gc2-3Gal moiety in epithelial cells of horse trachea supports evidence that recognition of Neu5Gc2-3Gal moiety is critical for viral replication in horses. The Neu5Gc2-3Gal is also associated with viral replication in duck intestine. Immunofluorescence assays with Neu5Gc2-3Gal specific antiserum detected this moiety primarily on the crypt epitherial cells of duck colon. Such recognition, together with biochemical evidence of Neu5Gc in crypt cells, correlated exactly with the ability of the virus to replicate in duck colon. These results indicate evidence of biologic effect of different sialic acid species in different animals. We found that the viruses maintained high SA2-6Gal specificities when grown in MDCK cells or following up to two amniotic passages; however, further passages in either the amnion or allantois resulted in the acquisitions of, or a complete shift to, SA2-3Gal specificity, depending on the virus strain. This change in receptor specificty was accompanied by the appearance of variants in the population with Leu→Gln mutations at position 226 in their HA. These findings suggest that presence of SA2-3Gal and lack of SA2-6Gal linkages in the allantois of chicken eggs are selective factors for the appearance of host cell variation with altered receptor specificities and amino acid changes at position 226. Nucleotide sequence analysis of human viruses showed that amino acids at 143, 155, 158, and 228 are linked to the viral recognition between Neu5Ac and Neu5Gc.